Ray Bear, the strength and conditioning coach of the Atlanta Thrashers, recently sat down with NHL.com's Mike Morreale to discuss just how important the NHL Scouting Combine is for the League's 30 teams. Get your 2008 Draft Center Ice Strech Fit hat now! 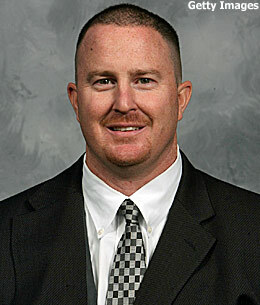 TORONTO -- Ray Bear has been the Atlanta Thrashers' strength and conditioning coach for the last five years. As such, he was front and center for the fitness tests at the 2008 NHL Scouting Combine here at the Westin Bristol Place Toronto Airport Hotel. Bear, who also served as the athletic trainer/strength coach for the Huntington Blizzard of the East Coast Hockey League during the 1997-98 season, sat down with NHL.com to detail the importance of the Combine. NHL.com -- Is there one fitness test that you consider most important? Bear -- "I don't really consider one test most important. The numbers are the numbers, so what I'm looking for is determination and drive that these guys show. If a player is lagging behind in a physical or aerobic test, I want to see the emotion that's needed to give that extra effort. You're looking more for intangibles that you wouldn't normally see on paper. I'm trying to see the way they carry themselves, their overall physical look; basically, the whole emotional package put together." NHL.com -- Do you feel bad for these young kids going through such rigorous tests? Bear -- "You won't find a lot of sympathy here. I don't take the emotional side of it because this is not a game to have sympathy. In this game, the guys who fight through will come to the top and we're not a feel-good kind of game. The ones who are going to play this game will have fought through difficult things both on and off the ice. Sympathy, I'm sorry to say, is not a big part of what we do." NHL.com -Are many of these fitness tests performed during training camp? Bear -- "Every team has different camps with different types of tests. Not all of these tests are performed. Basically, the battery of tests (at the Combine) is designed by York University with our (coaches') input. But most players will see some of these tests again in different venues." NHL.com -- Do you judge U.S. high school kids differently than Canadian junior players? Bear -- "I thought the high school-aged kids did a very good job. Whenever you're dealing with kids who are 17- or 18-years-old, you have to remember they haven't even hit their maturity. You can't judge all these kids on the same level as some you must judge on potential. Some come through who are more mature, but for the high school kids, you must look at the potential, realize what they've done and then project what they could eventually do physically. And really, that's a coin flip because you just don't know what the future holds, but at least you'll have a good idea." NHL.com -- What do you do with the data from the Combine? Bear -- "Don Waddell (Thrashers GM) takes a lot of what Dan Marr (director of amateur scouting and player development) says when it comes to the intangibles. They've already interviewed the player and know the kind of person he is. I'm going the other way, since I've never spoken to these kids. So, basically, I'm kind of going off what they're saying to me through their body language and their demeanor. Really, it's kind of amazing how the two correlate with each other between what they've said in an interview and what they've done on a bike. So when we come together, that's what we're talking about -- the intangibles in the interview and the fitness room." NHL.com -- Who have been some of the more well-conditioned athletes in your tenure with the Thrashers? Bear -- "I certainly want to be fair to everyone here, but Ilya Kovalchuk was a strong all-around player, as was Marian Hossa, and they have proven that on the ice. But if I had to pick one guy, I'd say (goalie) Johan Hedberg. Not because he's the strongest guy I've ever seen, but a player that's put together well from top to bottom. His work ethic is just phenomenal and his teammates would tell you the same thing. He's a workhorse in the gym and is a guy that just sticks out to me in excelling in what he does."